The pattern includes a full tutorial along with step-by-step instructions and color pictures to make it easy to follow along and make your own. Pattern pieces included also. I would classify this as an EASY LEVEL sewing pattern. If you purchase the pattern and find it too difficult for your skill level, I would be happy to refund your money! To purchase click BUY NOW button at the top of this page. **The pattern will be sent to you via email as an attachment. Expect up to 48 hours for delivery but most likely sooner (as I am a busy mommy). Please make sure your email address with PayPal is up to date. Occasionally you may have to check your junk mail if you think you may have not received it. this is so sweet! my sophia would love this. I voted for you! Hope to see you on that list soon! 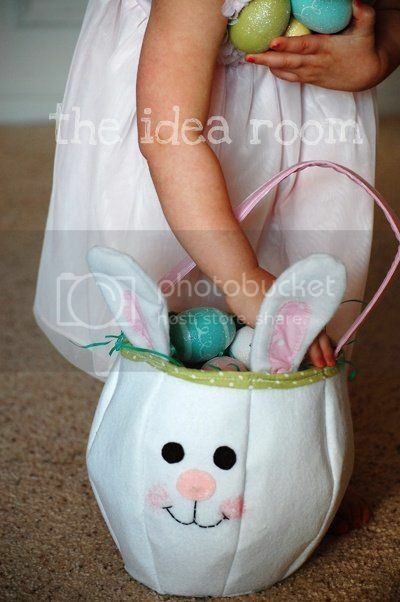 Love the bunny basket. Will be buying and making it soon. Trina…sorry! I must have hit the 2 instead of the 3 without noticing. The pattern is $3.00. Thanks for letting me know so I could fix it! Amy, could let us know what the skill level is? Some of us (ummm…me!) are only beginners when it comes to sewing and if it's too complicated I wouldn't want to invest. Otherwise, I'd LOVE to have this adorable pattern! It's darling!!! Great question Christina…I am not the greatest seamstress myself. Only quick and easy projects. I would say that it is a fairly easy pattern to follow. Especially since I have pictures to go with each step of the process, much like a tutorial on my blog. The most difficult part might be sewing the trim onto the top of the basket. If you purchase the pattern and it is too difficult for you, I would be happy to refund your money! Another great idea!!! I just bought the pattern and I am excited to sew these for my niece and nephew!!! A precious basket! I will pass this along to friends! Yeah! Darling pattern. I love that your little girl's nails are bright pink. I made two of them last night and if I can do it anybody can. 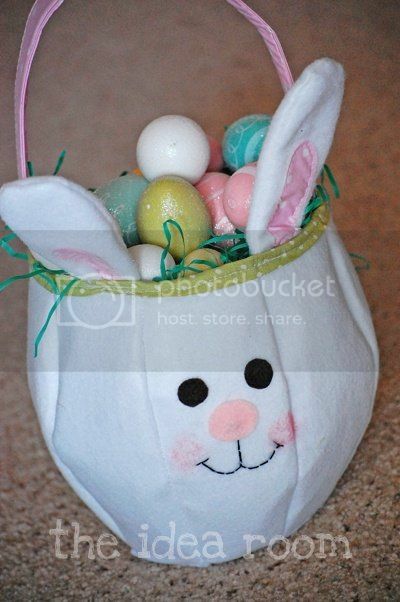 I thought the hardest part was sewing the bottom to the basket. I think they turned out really cute and I can't wait to give them to my niece and nephew. Thanks you so much Amy for making me look good!!! Hi, I went to purchase this but it seems to now be saying $4 in my paypal checkout, but says $3 everywhere else? Hm…Let me look at that. And make the change if necessary. 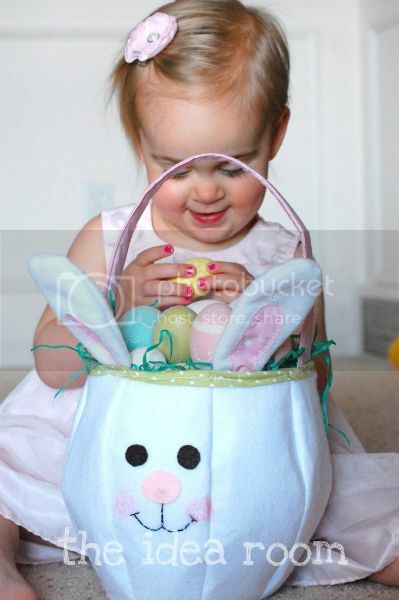 Just purchased the bunny basket and can’t wait to get the pattern for my grandchildren. Years ago a friend gave me a basket similar to this one. The eyes are different, it’s out of plush material and the ears are the handles. I was going to take it apart to make a pattern…now I don’t have to Thanks so much. You are so welcome Nancy! Sending over the pattern now. My computer I had been sending them on died…sorry for the slight delay! I hope they love their new baskets. What a sweet grandma!